Think of an adjustment as tuning a piano, adjusting each string so it produces the perfect tone. At Envive Chiropractic, we focus on providing natural relief specific to your body’s needs. 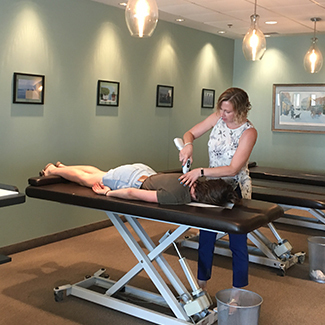 The Activator Method involves the use of a gentle, handheld instrument that lightly “taps” your spinal bones back into alignment. This method is safe for patients of all ages—from children to seniors and everyone in between. The Activator technique is extremely low force, quick, and provides care where your body needs it most. Using a computerized system, the Activator instrument measures your spine to determine the location of each vertebra. From there, our doctors get a better idea of where you need to be adjusted. Envive Chiropractic uses the latest technology available for evaluation of muscular and nervous system imbalance. Two computerized evaluations are performed as part of every patient’s examination to help determine how well the nervous system is functioning. The sEMG measures the quality, quantity, and symmetry of muscle tension and spasm by evaluating the electrical activity of muscles. Because nerves control your muscles, Subluxations disturbs overall nerve function, causing an abnormal amount of electrical current to flow to the musculature. This information, taken in concert with your health history and clinical findings, is useful in our assessment, and as an outcome assessment of the beneficial changes that result from chiropractic care. Patients receive a color printout of each examination, which increases their understanding of the overall balance of the nerve system. If you’ve been to a chiropractor before and have questions about differences between chiropractors, let the Doctors know. We want you to relax, enjoy and fully benefit from your chiropractic care.